Excellent golden-and-white plate cluster has a neat little loop of white crystals to rope you in with. 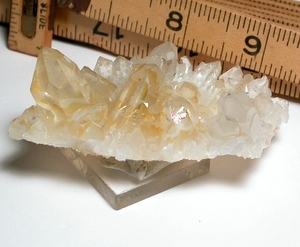 It's also possessed of two Rare 8h faced crystals, SIX uncommon 7h faced crystals, vivid rainbows, great clarity, and a nice sparkly plate bottom. 2-1/4x 3-1/4x 1" high, including the loop, great warm energy and good humor. Collier Creek Mines.